Australia’s treatment of asylum seekers has for years been unremittingly brutal. It isn’t because those seeking asylum are criminals, since to seek asylum is not a crime; and it isn’t because those arriving by boat lack grounds for seeking refuge, since over 80% are eventually assessed as being legitimate refugees. 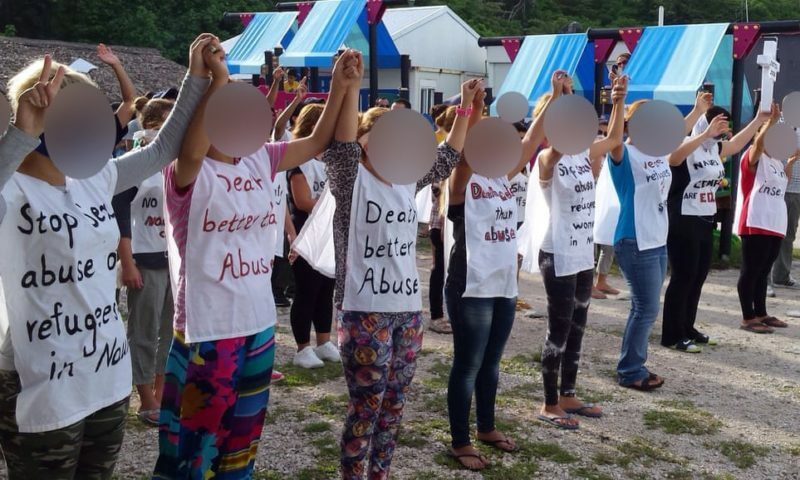 The conditions under which the asylum seekers are incarcerated, on the client states of Nauru and Manus Island, are more sadistic than those for even the worst murderers and rapists in Australia. This is the case even when the asylum seekers in question are women, children, the elderly or the disabled. Clearly, then, this is not a matter of the Australian state enacting retributive justice, since the latter mainly makes sense in an honour-based society, and in any event, nobody is suggesting that the nautical arrivals have anything particularly odious to expiate. At least some of the refugees over the years may have been prompted to take flight as a result of Australian foreign policy, which includes the military invasions of Iraq and Afghanistan. Instead, the horrific conditions to which refugees to Australia are submitted are best understood as a deterrent, functioning under the signifier of ‘security’ (specifically that which Australian politicians term ‘border security’). The aristocratic ethics of the Homeric heroes prescribes that one must show generosity to strangers. But, as Jacques-Alain Miller once put it, ‘security is essential for modern man. This is to affirm that heroism no longer means anything.’ The path is thus cleared for a different ethics, with that of the capitalist replacing that of the master. Like so much else in the capitalist world, ‘border security’ relies on a globalised system of surveillance and punishment, in which the latter is literally ‘offshored’ and Australians are spared the sight of their state’s cruel policies. The tendency to treat refugees as a question of ‘border security’ is also globalised, and in this, we Australians resemble Europeans and Americans, even if here, the systematised cruelty is more banalised than elsewhere. The signifier itself has associations to the notion of the sinecure, and it isn’t difficult to perceive Australia’s policies as lacking care. If, in languages other than English, I say that sono sicuro, or estoy siguro, I am conveying certainty, lack of division. This is the second sense in which harsh ‘border security’ functions as a deterrent, in that it is not only addressed to those fleeing persecution by sea, but also – and perhaps primarily – is intended as a ritualised prophylactic aimed at assuaging the anxieties of Australian subjects. It is surely not coincidence that some of the settlers who arrived to Australia by boat, under the auspices of European colonialists, were responsible for genocide and the continuing biopolitical subjection of the native inhabitants. Let us not forget, also, that the invention of the concentration camp, before it was deployed by fascists and others in the 20th Century, derived from the liberal technocratic ideology that accompanied British imperialism. As Arendt argued, imperialism is ‘expansion for expansion’s sake’, and besides being the origin of ‘totalitarianism’, is perfectly compatible with liberal democratic ideology. None of this is a problem for the consistent bigot (whom we could, after Lacan’s seminar on ethics, refer to as a ‘knave’) but it requires considerable Verleugnung for the supposed advocates of liberal democracy. Thus, on the one hand, there is national anxiety, and on the other, aggressive compulsion as a method of dispelling it. These methods, however merely ‘technical’ they may appear, are never neutral, and a com-pulsion can be understood as something that is done with the drive. The end result is a walled world wherein national boundaries become the large-scale equivalent of gated communities, and segregation and apartheid are effectively globalised. ‘Security’ is the signifier under which anxiety and jouissance are organised not only for ‘border security’, but also for other crises, particularly the impending catastrophes of climate change. These will include extreme weather, and food and water shortages, but for technocratic governments, are increasingly addressed under the question of ‘food security’. The very wording of the problem in these terms is suggestive of national paranoia and a foreclosure of coordinated, collaborative responses to a collective problem (the lack of which will, naturally make the problem worse). Each nation under the signifier of ‘security’ becomes One-all-alone consoled by its own nationalist fantasy, and as Edward Said once remarked, these nationalist agendas all tend to resemble one another, notwithstanding the idiosyncrasies of each. The super-rich – when they are not planning to escape these woes by colonising Mars – are holding conferences to work out how to harness technology in the service of security. How, they ask, will they overcome the problem of paying security guards to protect their compounds once currency has become worthless? In keeping with the discourse of capitalism, existential, structural problems are reduced to matters of technicality, with all the disavowal that this requires. This is one of the benefits of elevating ‘security’ to the status of S1: the threat of security breaches provides endless grounds for a state of exception, for an unlimited casus belli and ultimately, for fascism. In the name of security, the Australian state, with almost total support from all political parties, sent in the army to address concerns about domestic abuse in Aboriginal communities, calling this project ‘The Intervention’. This is a way of naming a turn in contemporary politics: endless security, but no care, and with violent segregation ordinarised. It is reflected in Trump’s preoccupation with walls, and with Bolsonaro’s threats to implement a violent mode of segurança. It is timely, as the NLS heads to Tel Aviv in 2019, to ponder the extimate bonds between liberal technocracy, colonialism and fascism established via ‘security’; it is a national analogue to the relations between anxiety, disavowal and compulsion.